As part of Unionist Voice’s ‘Stand Up Against Sectarianism’- #SUAS- series, today we look at the brutal IRA murder of three Scottish soldiers in 1971. 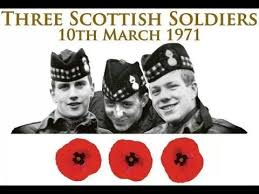 On the 10th March 1971 IRA terrorists shot dead three unarmed British Army soldiers. The brave soldiers served in the 1st Battalion of the Royal Highland Fusiliers. All three soldiers were off-duty and in civilian clothes when they were gunned down in cold blood by the cowardly IRA unit. The soldiers were lured from a city centre bar in Belfast and taken to a remote location and shot. No one has ever been charged with their murders. Sinn Fein has never apologised to the families, nor assisted their quest for truth by providing information about the IRA murders. 112 Responses to "#SUAS series- Cowardly IRA terrorists murder three Scottish soldiers"
of course like your website but you have to check the spelling on quite a few of your posts. A number of them are rife with spelling issues and I in finding it very bothersome to tell the reality on the other hand I’ll surely come again again. Great post. I was checking constantly this blog and I’m impressed! Extremely helpful information specifically the last part 🙂 I care for such information much. I was seeking this particular information for a long time. Thank you and good luck. Thanks for your entire efforts on this site. Debby takes pleasure in conducting internet research and it’s really simple to grasp why. My partner and i hear all of the lively medium you offer valuable thoughts by means of your blog and in addition recommend contribution from other people about this matter then my princess is in fact starting to learn a great deal. Enjoy the rest of the new year. Your carrying out a powerful job. I would like to point out my admiration for your kind-heartedness for those people who absolutely need assistance with that subject matter. Your special dedication to passing the message all around came to be extraordinarily good and have always allowed those just like me to arrive at their dreams. Your personal valuable help indicates so much a person like me and still more to my office colleagues. Thank you; from each one of us. Hi I am so excited I found your blog, I really found you by accident, while I was researching on Askjeeve for something else, Anyhow I am here now and would just like to say thanks a lot for a tremendous post and a all round thrilling blog (I also love the theme/design), I don’t have time to browse it all at the moment but I have book-marked it and also added in your RSS feeds, so when I have time I will be back to read a lot more, Please do keep up the superb job. Hello would you mind stating which blog platform you’re using? I’m going to start my own blog soon but I’m having a tough time choosing between BlogEngine/Wordpress/B2evolution and Drupal. The reason I ask is because your layout seems different then most blogs and I’m looking for something unique. P.S Sorry for getting off-topic but I had to ask! Hey very cool website!! Man .. Beautiful .. Amazing .. I’ll bookmark your web site and take the feeds also…I am happy to find a lot of useful information here in the post, we need develop more strategies in this regard, thanks for sharing. . . . . .
Hello There. I found your blog using msn. This is a very well written article. I will be sure to bookmark it and return to read more of your useful information. Thanks for the post. I?ll definitely return. I definitely wanted to write down a brief remark in order to appreciate you for the marvelous advice you are posting on this site. My considerable internet research has finally been rewarded with incredibly good know-how to share with my classmates and friends. I ‘d assert that most of us site visitors are undoubtedly fortunate to be in a wonderful place with so many lovely people with interesting ideas. I feel really grateful to have seen your site and look forward to really more pleasurable times reading here. Thank you once more for all the details. I have read several good stuff here. Definitely worth bookmarking for revisiting. I surprise how much effort you place to create this type of fantastic informative site. I would like to thnkx for the efforts you have put in writing this web site. I’m hoping the same high-grade web site post from you in the upcoming as well. In fact your creative writing abilities has encouraged me to get my own blog now. Actually the blogging is spreading its wings fast. Your write up is a good example of it. Magnificent goods from you, man. I’ve understand your stuff previous to and you are just extremely wonderful. I actually like what you have acquired here, certainly like what you’re stating and the way in which you say it. You make it entertaining and you still take care of to keep it sensible. I can not wait to read much more from you. This is actually a tremendous website. fully, however this post gives pleasant understanding yet. Whats up! I simply would like to give a huge thumbs up for the good data you might have here on this post. I can be coming back to your weblog for extra soon. I’m still learning from you, as I’m trying to reach my goals. I absolutely liked reading all that is posted on your website.Keep the information coming. I loved it! Thank you, I have just been looking for information approximately this topic for a long time and yours is the greatest I have discovered so far. But, what in regards to the conclusion? Are you positive in regards to the source? great issues altogether, you just gained a emblem new reader. What would you suggest in regards to your publish that you just made some days ago? Any sure? certainly like your web-site but you have to check the spelling on several of your posts. Several of them are rife with spelling problems and I find it very bothersome to tell the truth nevertheless I’ll certainly come back again. Do you mind if I quote a couple of your articles as long as I provide credit and sources back to your site? My blog is in the very same niche as yours and my visitors would definitely benefit from a lot of the information you present here. Please let me know if this alright with you. Cheers! Have you ever thought about publishing an e-book or guest authoring on other websites? I have a blog centered on the same information you discuss and would really like to have you share some stories/information. I know my readers would enjoy your work. If you’re even remotely interested, feel free to shoot me an e mail. Thank you for any other informative website. Where else may just I am getting that kind of info written in such an ideal means? I have a project that I’m simply now working on, and I’ve been on the look out for such information. My wife and i got fulfilled that Raymond could do his studies from the precious recommendations he grabbed in your web pages. It’s not at all simplistic just to always be freely giving helpful hints which the others have been selling. We really take into account we need the writer to give thanks to for this. All the illustrations you made, the straightforward site navigation, the friendships your site assist to promote – it’s got everything impressive, and it’s really facilitating our son and our family believe that this content is enjoyable, and that’s exceedingly serious. Thank you for all! Helpful info. Fortunate me I discovered your site by chance, and I am stunned why this coincidence did not came about earlier! I bookmarked it. I absolutely love your blog and find a lot of your post’s to be just what I’m looking for. Do you offer guest writers to write content for yourself? I wouldn’t mind publishing a post or elaborating on a number of the subjects you write concerning here. Again, awesome website! You can definitely see your enthusiasm in the paintings you write. The world hopes for more passionate writers such as you who are not afraid to say how they believe. All the time go after your heart. Howdy! I simply wish to offer you a big thumbs up for the excellent info you’ve got here on this post.